Orchard Road is one of the iconic shopping destinations people love to visit. Adjoining shopping malls in a line present a unique view and there you can get international clothing, footwear, art, and home décor brands. Not just the fashion brands but multinational fine cuisine restaurants and eating joints also adorn Orchard Road. The name given to this place is apt, as you will get anything and everything that you get in the Indian subcontinent. Therefore, if you have a penchant for Indian food, wardrobe, and other Indian things and you are in Singapore, you know where you have to go. Little India is a place in Singapore that is too vibrant and culturally authentic. From Indian sarees, to henna tattoos, and Indian spices, you have a wide assortment of things to choose from. If you are up to shop luxury brands like Fendi, Miu Miu, Prada, and Cartier then Marina Bay Sands is where you should be in while you are in Singapore. This mall claims to be the largest luxury shopping mall in Singapore. If your budget permits to shop then it is pretty good, if not then you can just visit the mall for a window shopping and to have beautiful view of the Marina Bay Skyline from the mall. If you are on a lookout for some real good electronic stuff then surely you must head to the Civic District. Floor after floor filled with electronics like cell phones, game consoles, laptops, and cameras, this place is worthy for one who truly loves electronics. 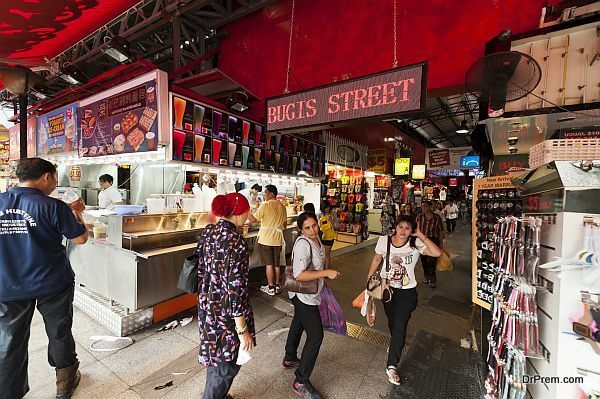 Bugis Street in Singapore is a place that has something or the other to offer everybody, from expensive luxury goods to affordable everyday things. You can visit this street for some cheap shopping . Singapore is a shopping paradise, and the idiom “shop till you drop” comes alive when you go shopping in the streets and the malls of Singapore.